Treadle Yard Goods will be closed on Sunday January 1, and Monday January 2. Please consider bringing in a new, unwrapped toy or non-perishable food item to donate to folks in need this weekend. We need to deliver our donation boxes on Monday, so you have 2 full days to still contribute! This Saturday, December 3rd, is the Annual Grand Meander celebration on Grand Ave.
Come celebrate with us at Treadle Yard Goods with %20 off holiday-themed printed cottons for the day and a free Make and Take activity with the talented Nina and Olivia! Choose a fat quarter at Treadle and then head next door to Treadle 2 between 2 and 5 PM to whip up a reusable gift bag. You may also feel free to bring along a non-perishable food item or new, unwrapped toy, as Treadle is a drop-off site for both Second Harvest and Toys for Tots. Kick off the holiday season with us at Treadle Yard Goods and don't forget to enjoy the Grand Meander activities all along the Avenue. 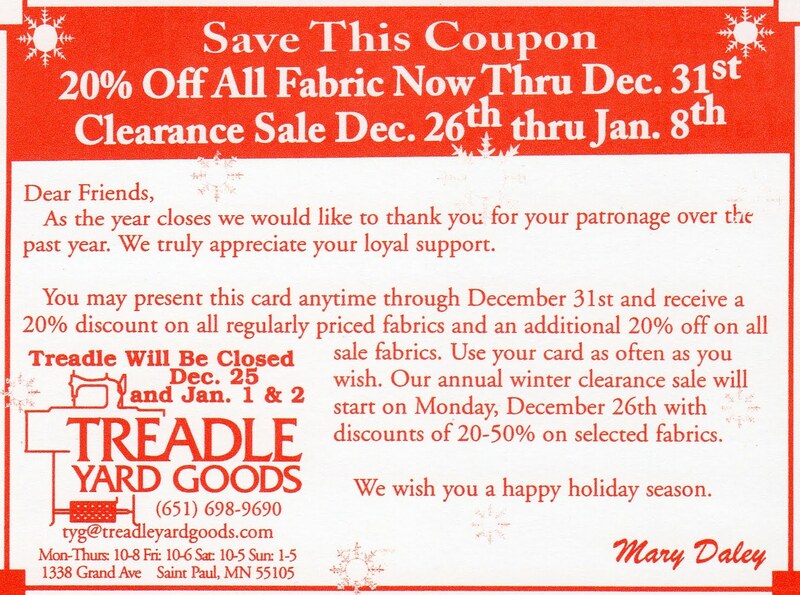 At Treadle we are celebrating the beginning of the holiday gift making and giving season with savings for you. We invite you to visit Treadle on Friday, Saturday and Sunday, November 25, 26 and 27 for savings of 20% on all fabrics and patterns. Enjoy 20% off all regularly priced fabrics and patterns and take an additional 20% off all sale fabrics. Sew up a fun hostess apron, cozy flannel loungers, unique pillowcases or a warm Shetland wool muffler or poncho. We have the ideas, know how and raw materials to help you find something for everyone on your list. First of all we enjoyed seeing so many people at the Sewing Expo last week. Thanks so much for making that day a success! Second, we have more and more new and fun fabrics coming in all the time, and I thought I would highlight some of the cuter ones for kids that we received this week. First, there is a darling group of fabrics from Quilting Treasures featuring the beloved children's story Goodnight Moon. This panel would work well in a quilt or pillow for the baby's room, or you could simply mount it on a frame and have some instant artwork. The other exciting new fabric line comes from Moda and Oliver + S - Cape Ann. We carry these adorable fabrics in both flannel and cotton broadcloth. If you make anything from either of these new lines of fabric, please upload them to our Treadle Flickr Group. 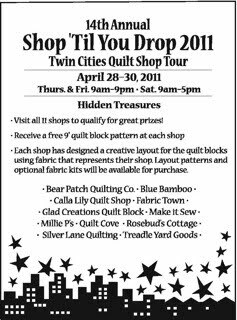 We invite you to join us at the Original Sewing and Quilt Expo at the Northland Inn in Brooklyn Park on November 10, 11 and 12. Our booth will be chock full of wonderful garments and gorgeous fabrics. Several of our garments will grace the runway during the noontime fashion show. Fashion Sewing Club will not meet at Treadle on Tuesday, November 8, or Saturday, November 12. The Material Girls will be taking their show on the road to the stage at the Original Sewing and Quilt Expo on Thursday, November 10, at 9:30 a.m. and Saturday, November 12, at 10:15 a.m. Their booth will be right next door to ours! We hope to see you there. So my boss Mary has just returned from a trip to the big fabric convention in Las Vegas and following her are many new fabrics including this table full of Missoni knits! There are still many new wools and beautiful knits on their way. Come on in and take a look! We here at Treadle are having a little Christmas in October this week. New and exciting things are arriving daily for the Fall and I'll share some glimpses here on the Treadle Blog for the next few days. We'll start small today, in size at least. We received some adorable new trims this week from Renaissance Ribbons. Very fun for headbands or edging a little girl's dress. On the left there is a hint of what's to come in tomorrow's post, so stay tuned for that! We also got in these very fun bias bindings from Anna Maria Horner. Bias tape is so useful, but is often quite boring. These new trims are anything but boring and I can't wait to throw one into a project. Now what could be coming to this empty table? You'll have to wait until tomorrow to find out. Don't forget to come in for our annual Fall Sale. You only have 4 more days to come in and save 20-50% on every fabric in the store! New and exciting things are arriving daily for the fall and I'll share little glimpses here on the Treadle Blog for the next few days. It's time for our annual Fall Sale at Treadle Yard Goods! Come in and save 20-50% on all fabrics! 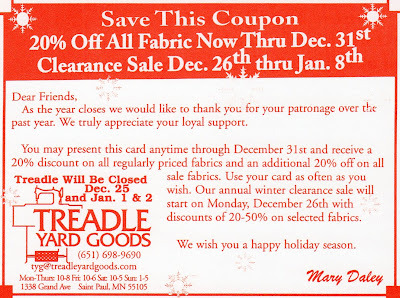 For the first time in Treadle history we'll also have discounts on patterns. Come in and get some great deals! See you soon, and Happy sewing. Time for Some Back to School Sewing! We're coming to the end of the Summer, and that can only mean one thing for Treadle Yard Goods: The wools are coming! We have started receiving our fall selection of wool fabrics and they are wonderful! There are lots more on order, so keep coming back for more updates on that! - the prints you know and love, but now in a lovely drape-y rayon and cozy and oh-so-soft corduroy. Perfect for a Fall jumper or skirt. Don't forget to head over to Flickr and show us what you're making! We have just added another lovely sewing enthusiast to our Treadlette family. Be sure to say hi when you come in next. 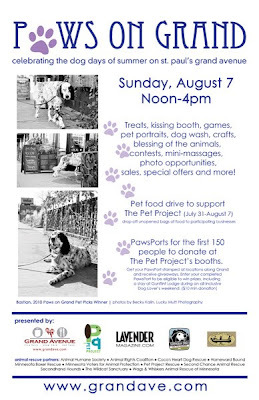 Sunday, August 7th is the annual Paws on Grand event where your pooch can have a day of fun! At Treadle Yard Goods we're celebrating Paws on Grand by providing doggy treats and water for your 4-footed friend. For this day only, we'll be open from 12-5 instead of our usual 1-5 Sunday hours. Also, if you bring in a donation of dog food you can receive a 10% discount coupon for fabric. Head over to the Grand Ave Business Association website for more information about the fun activities up and down the avenue. Oliver + S designer Liesl Gibson has some new patterns out, and the big news is that they're for grown-up ladies! 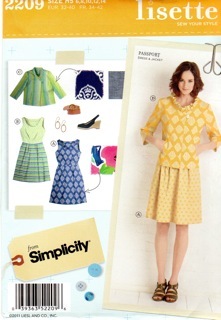 The Lisette patterns are in the Fall Simplicity pattern collection and they are delightful. When you make up one of these beauties, please post a photo in the Treadle Yard Goods Flickr group and we'll share them here. Tabbed blanket and burp cloths, a photo by Patty the Snug Bug on Flickr. Patty made up these sweet burp cloths and tabbed blankets using fabric and trims from Treadle and other stores. Matching boys, a photo by creatively at home on Flickr. Stephanie has made the sweetest collection of outfits for her adorable boys. 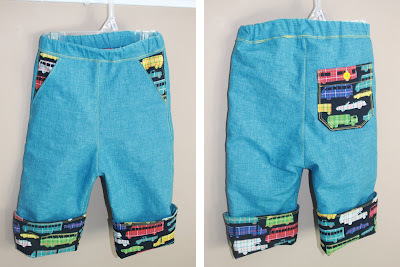 These are from Growing Up Sew Liberated, which we reviewed just a couple of weeks ago on the blog. Ready for fishing, a photo by creatively at home on Flickr. This sweet backpack and hat are from Little Things to Sew by Oliver + S designer Liesl Gibson. We're going to have a little display of the best of Treadle Yard Goods on Flickr now. Our customers are so wonderful and full of creativity and we're so impressed with them all. Enjoy these next few posts! It's been a while since the last book review corner, but I just couldn't resist sharing this new find. Growing Up Sew Liberated is the new book from Meg McElwee, and it is a beautiful collection of clothing, toys, accessories and parenting advice. You may recognize Meg's name from her other book Sew Liberated, which I reviewed in this space about a year ago. Meg's genius for easy-to-follow and carefully planned projects is again highlighted here. In this way Meg guides us through a day in the life of a child. There is a nice range of difficulty represented in Growing Up Sew Liberated. which is a much more labor-intensive project. Don't hesitate to try the projects with a higher degree of difficulty, however. The directions are clear, concise and designed to guide sewists of all levels through to a successful project. The clothes are sized for newborn through size 5. The accessories, however, would be appropriate for children up to age 10. Meg McElwee is a AMI-certified Montessori teacher, designer and mama to two young boys, find more of her inspiring projects here at SewLiberated. Just a reminder, as well, that the final day of our Summer Clearance Sale is tomorrow, Sunday the 17th of July. Come in to Treadle for our Summer Clearance Sale running from now through the 17th of July. At least 10% off everything, with discounts up to 50% on selected items. We would also like to remind you to come join us and share your love of sewing. Fashion Sewing Club is a monthly meeting (held the second Tuesday of every month) featuring garments, pattern modification and review, and the latest news in the sewing world. You will be provided tips, techniques and new ideas that are sure to inspire you. High fashion, chic wear, proper fit, machine embroidery, children’s wear and Home Dec are just some of the topics we will explore. Whether you are an experienced sewer or just beginning – this club is for you! Bring Show and tell! The fee is $10 (however, your first meeting is free!) and can either be prepaid by visiting the link below or paying at the meeting. The next meeting is Tuesday, July 12, at 10:30 a.m., and again at 6:30 p.m, and is held in Treadle 2. Please join us for either the morning or evening meeting. We have the new line of fabrics from Anna Maria Horner in the store, and I know you will agree that it is quite lovely. Loulouthi is a treasure box of all that I love about flowers and fabric coming together in form and inspiration. The word loulouthi simply translates from the Greek as “flower”. But in an ongoing story, my cultural heritage has enlivened these fabrics with visions of needleworks in progress, the gentle tending of village gardens, and the luxury of living alongside everyday works of art. The language of flowers and floral handiwork has spoken to me since before I could thread my own needles, and this collection is my reply to all that beauty. Such a creative woman, with a truly intentional design aesthetic. As we have come to expect, her cotton voile fabrics are soft and dreamy, just the thing for a lightweight summer top or dress. Please come to Treadle and choose one of these for your very own, but don't come on the 4th of July, as we will be closed for the holiday. Please join me in a collective Awwww, while I share the adorable outfit that our customer Karin made for her son's first birthday. Nice work, Karin. Such a sweet outfit! Please keep posting your photos of your great work on our flickr group page, we love to see what you're making.